The SE-S400 is combining style with functionality. The SE-S400 10-line LCD provides the operator a reference for the current transaction to eliminate errors. Up to five (5) items, the transaction subtotal and the price of last item entered are all displayed for the operator’s review. The SE-S400 also boasts a 2X2 pop-up customer confirmation display with the last item’s name, price and the transaction subtotal. 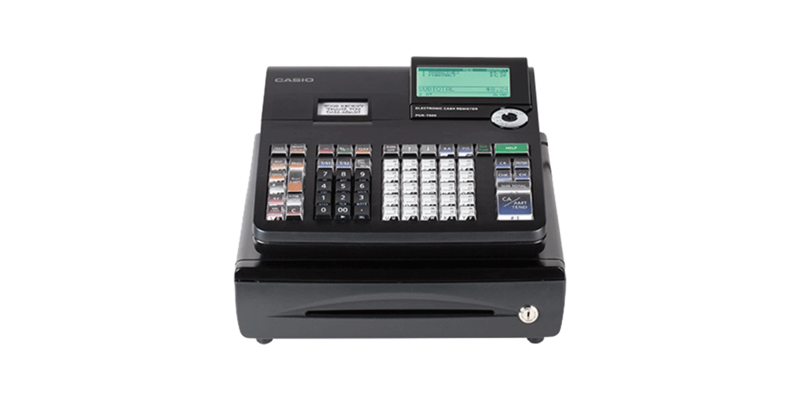 The SE-S400 offers a raised keyboard with 25 department keys that can be preset priced or open to enter prices manually allowing retailers to categorize their entry inputs. A scanner can be connected to one of the two (2) serial ports allowing up to 3,000 items to be scanned. The SE-C400 single (1) station thermal printer can be used as either a customer receipt printer or as a journal printer.